To use this multi-user machine, we'd need to log-in from a terminal. 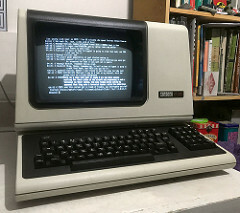 If you were fortunate enough to find a vacant PC, you could use the terminal emulator program to connect. This had the very useful feature of being able to switch between screens so you could operate many sessions at once. I would usually have one with the email program running so I could switch to it occasionally to see if any new messages arrived, while a second session would run EMACS for whatever I was writing. A last one would compile and run stuff. If I wasn't quite so fortunate to find a vacant PC, I'd have to use one of the Falco T310 terminals. These were serious old-school terminals that connected to that machine over a serial port. Actual RS232 connecting to a multiplexing box in the corner. The university had maybe a hundred of them. Because they did only have a serial connection, you could only have one session per terminal. No fast switching between sessions for you - if you wanted to check your mail you had to shut down whatever you were doing and start up the mail reader. These terminals weren't all bad. It understood the standard ANSI codes to move the cursor about, so there wasn't too much friction moving between the two. We coped and got on with the job. One day, I intended to review a source code file, so I typed a "cat" command to show the listing, except I had accidentally run cat for the compiled binary executable instead. Oops! The screen filled with noise punctuated with beeping noises. Efforts to stop the onslaught were in vain as the buffers filled up with unintelligible bytes. Then something unexpected happened. The screen changed mode and lines were drawn mixed in with the text. Not the box drawing characters I was used to but proper lines, drawn at funky angles spanning across most of the screen. These terminals supported some sort of control codes for vector line drawing, and my executable code just happened to randomly contain those codes. I must find them! Living the student life, I wasn't getting much of a chance to exercise my artistic muscles. Back at school, I knew how to program graphics in Borland Pascal and I'd come up with simple games and create animated art. Even dull homework projects would have a bit of a flourish thanks to creative use of the 640x480x16 mode. On UNIX in contrast, I was back in the 80s with an 80x24 character display, yet here was an elusive graphical mode I hadn't seen in months. Actually finding what those magic control codes were was easier said than done. Once I had accidentally entered this graphical mode, I found I couldn't type commands anymore. The only way I knew to get back to normal was to power cycle the terminal and login again. My attempts to split the file in half and display one of the halves would be accompanied with incessant loud beeping from all the BEL/7 bytes, which greatly disturbed the other people in the room. That amount of beeping could only mean I was up to no good! After spending a day trying to extract the codes I needed, I had to give up. I was unfamiliar with working with Unix beyond dealing with plain text files. I knew how to open files in binary mode back on Borland Pascal, but not on any language I had access to in Unix. There was no StackOverflow to ask so I was stuck impotently banging rocks against this monolith. This was software development in those dark ages. Next: Checking in at The Motel. BBS Systems, Fidonet and reinventing the remote-desktop.